** The inclusion of oats as part of a varied and balanced diet low in saturated fat can help reduce blood cholesterol. One 40g portion provides 1.8g of beta glucan soluble fibre from whole oats which is 60% of the 3g recommended intake. The beneficial effect is obtained with a daily intake of 3g of oat beta glucan. Our porridge oats are delicious with milk, water or your favourite plant based drink. Originally established by the Odlum Family in Portlaoise in 1845, Odlums has been an integral part of Irish households for generations. To this day we are dedicated to bringing you the finest quality, great tasting foods to help you make the most of your day. Add some fresh berries, nuts and a swirl of honey or for a really nutty twist, add a dollop of your favourite nut butter. Once opened store in an airtight container in a cool dry place, away from strong smelling products. Steep the oats for a couple of minutes before cooking, as this helps them cook quicker. 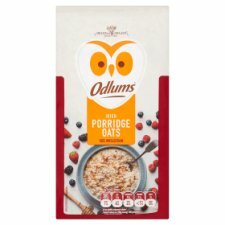 Pour 1/2 cup (40g) of Odlums Porridge Oats into a saucepan. Add 1 cup (220ml) of water or milk. Bring to the boil, reduce heat and simmer for approximately 3 minutes, stirring continuously. Add 1/2 cup (40g) of Odlums Porridge Oats to 1 cup (220ml) of water or milk into a deep microwaveable bowl. Stir and place bowl in microwave. Microwave on high for 2 minutes (based on 900W). Do not cover bowl. Stir midway through cooking time. Stir well and allow to stand for 2 minutes before eating. Note: Cooking times may vary according to microwave rating.